Lets take a look at two reviews to see how AMD's new Radeon HD 7970 GHz Edition performs. First we head to AnandTech, they conclude that for the first time in six years, AMD is truly competitive for the single-GPU performance crown. The Radeon HD 7970 GHz Edition isn't fast enough to outright win, but it's without a doubt performant enough to tie NVIDIA's GeForce GTX 680 as the fastest single-GPU card in the world. The reviewer notes this hasn't happened since the Radeon X1950 XTX in 2006, as AMD's flagship single-GPU model typically trails NVIDIA's flagship once NVIDIA has caught up. Despite the near identical performance, the reviewer notes the GeForce GTX 680 remains the more desirable card as AMD's new 7970 GHz Edition has significantly higher power consumption and noise levels. 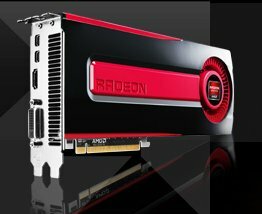 Only in multi-monitor configurations AMD's Radeon HD 7970 GHz has an edge over the GTX 680, AnandTech reports they saw a 6 percent performance advantage, largely thanks to the 3GB GDDR5 versus 2GB for the GTX 680. With that said, AMD has made a great sacrifice to get to this point, and it’s one that’s going to directly impact most users. AMD has had to push the 7970GE harder than ever to catch up to the GTX 680, and as a result the 7970GE’s power consumption and noise levels are significantly higher than the GTX 680’s. It’s unfortunate for AMD that NVIDIA managed to tie AMD’s best gaming performance with a 104-series part, allowing them to reap the benefits of lower power consumption and less noise in the process. Simply put, the 7970GE is unquestionably hotter and uncomfortably louder than the GTX 680 for what amounts to the same performance. If power and noise are not a concern then this is not a problem, but for many buyers they're going to be unhappy with the 7970GE. It’s just too loud. A second opinion can be found at The Tech Report, they write the Radeon HD 7970 GHz Edition is better value than a stock-clocked GeForce GTX 680, and that power consumption turned out to be closer than expected. Their tests also show though that the 7970 GHz produces a noise level of 50.6dBA in load, significantly more than the GTX 680's 44.4dBA. The Radeon HD 7970 GHz Edition has indeed recaptured the single-GPU performance title for AMD; it's even faster than Zotac's GTX 680 AMP! Edition. And at $499.99, the 7970 GHz Edition is unambiguously a better value than the stock-clocked GeForce GTX 680. Everything seems to be going AMD's way—even our power consumption results turned out to be closer than expected. I'd say that qualifies for mojo reclamation status, but I suppose the market will decide about that one. We're curious to see whether GTX 680 cards will continue to be scarce once the 7970 GHz Edition lands on store shelves.